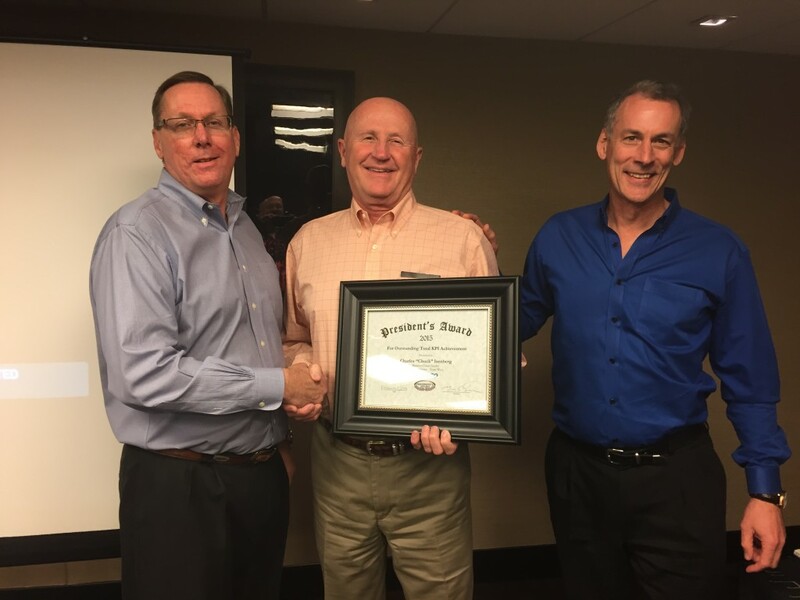 On February 2, 2016, KASCO’s President Brian Turner (right) and VP Sales & Marketing Tim McCreery (left) awarded its first annual President’s Award to Charles “Chuck” Isenberg for his outstanding KPI performance in 2015. Hailing from Southern California, Chuck is a Business Team Leader who manages a team of 11 Field Service Reps that specialize in the service and repair of commercial food equipment and retail store equipment. Candidates for the award included nine other Business Team Leaders who manage the remainder of KASCO’s more than 120 service reps across North America. The KPI’s evaluated for the award included Revenue $ Increase Over Goal, Revenue % Increase Over Goal, Inventory Turns, Service Calls on Time, and Routes on Time. Chuck will celebrate 42 years in the business this July, including 16 years as a division manager and 20 years as KASCO’s west coast business manager. Congratulations Chuck!